Rajasthan is the land of the Maharajas, an exotic and colourful home to the legendary warriors of yore, famous for their gallantry, chivalry, revelry and romance. Its kingdoms redolent with imposing forts, ethereal palaces, boisterous bazaars, vibrant people, timeless traditions and centuries of art and culture. Each of its cities has a unique character and a different colour, its capital Jaipur has the ditinction of being pink, also considered the colour of hospitality. The Pink City of India, the royal capital of Rajasthan, Jaipur was built by Maharaja Sawai Jai Singh in 1727 AD. The ancient heart of this regal city still beats in its fairy tale palaces, its magnificent fortresses perched on barren hills, and in the broad avenues that provide a superb transport network throughtout the city. Soak in the medieval flavour of this city by exploring its many monuments, go on a camel safari to explore unending stretches of the Thar desert , enjoy the cool evenings boating at the Ramgarh lake or linger in its boisterous bazaars, laden with handicrafts, handloom, jewelery, bandhani, block print, blankets and trinkets. The panoramic landscape of Rajasthan has been a silent witness to some of the most intense battles in history, tragic seiges, astounding victories, the unearthly valour of fine-cheeked Rajputs, charging to their deaths in ash and saffron. Dedicated Maharanis committing jauhar by the thousands and its forts and palaces that have lived on to tell the tale. Once ruled by the Mauryan empire, Rajasthan became the stronghold of the Rajput clans in 700 B.C. Around the 12th century parts of Rajasthan were occupied by Muslim rulers but it was only in the early18th century under Mughal emperor Akbar's rule that all of Rajasthan was united into one province. After the decline of the Mughal rulers the Marathas penetrated into Rajasthan. As a legacy of this back-and-forth rulership of the province it has a rich culture and architectural heritage blending toghether Mughal, Hindu and Jain influences. 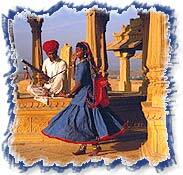 Rajasthan is the region of the proud Rajputs, their valour and chivalry now a part of legend. They are of Scythian descent- a stock which moved out from the Caucasus in Central Asia towards the Indus Valley on the one side and the Germanic parts of Europe on the other. What meets the eye when travelling through Rajasthan though are dusky, lissom Rajasthani women with sparkling, kohl-limned eyes, adorned with silver jewellery and thick, bone bangles worn way above the elbows. They sport backless cholis, generously pleated long skirts rich in mirror work and embroidery. A long odhni or head covering flowing gaily behind them completes the picture of ethnic allure. They smile with a winsome charm as they sway past with several terracotta pots casually poised on their heads. The men, without exception, sport colourful, flamboyantly styled turbans. Their swarthy faces flaunt large mustachios, displaying careful grooming and obvious pride. In rural Rajasthan, a moustache is an indication of manhood, virility and macho power. Along with the Rajputs this land is also inhabited by Muslims and Brahmins. The Bhils and Meenas are two of the biggest tribes to be found here. The hard life of the desert dwellers made them seek means of making life more pleasant, this gave rise to a vibrant culture that still lives on. Fairs and festivals, dance and music, colours, costumes and wandering balladeers truly make it a setting difficult not to fall in love with. The royalty also aided and abeted creative arts and exquisite miniature paintings, precious manuscripts and craftily designed wares can be seen in their palaces and museums. In this desert climate not much could be grown in the way of crops but you are in for a real treat when it comes to Rajasthani cuisine. The inventive chefs of yesteryears kings have created some mouthwatering delicacies. High on the must-sample list are the dal bati churma, gatta ki sabzi, mangodi, bajra ki roti, mirch pakodi and varoius chutneys and papads. The smoked Rajasthani kebab - sule is bare-be-cued in about a dozen different ways and is a non vegetarian delicacy. Besides, each region is distinguished by its popular sweet - Mawa Kachori from Jodhpur, Malpuas from Pushkar, Rasogullas from Bikaner, Ghevar from Jaipur..to name a few. 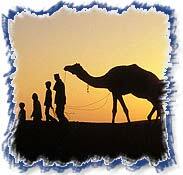 Rajasthan is an ancient land with a diverse culture and many timeless traditions still thrive in its heartland. The aarti, tilak, namaskar and use of garlands is a common welcome for important guests. Madana the Rajasthani art of decorating courtyards and prayer halls, using coloured powders has also been kept alive. Clothes in kaleidoscopic colours complemented by ornate jewelery is a trademark of the Rajasthani people. The common dress of the women constitutes a sari or odhani, choli, ghaghra or lahanga. Besides, the women of high status and ranks wear dupatta and patka. The use of chappals or sandals or jutees is also common but ladies of high families use coloured sandals studded with gold threads and stars. Turban, the head dress of Rajasthani men, is a differential pattern, of each geographical region designed to suit terrain and climatic influence. All over Rajasthan, the bandhni, the tie-and-dye sari and turban reign supreme. The dances of Rajasthan seem to have originated from the depths of the desert and the hearts of its people. Women dancers pirouette gracefully and their Ghaghras (skirt) flare out in a blaze of color and movement. Regal men in fulsome, gathered white ankle-length skirts and brilliant turbans swirl and execute intricate choreographic patterns. Most popular among these sensuous and riveting dances are Ghoomar, Bhavai, Kachhi Ghodi, Chari, Kalbeliya, Gair, Kathputli and Terahtaali. The rythms and tunes of Rajasthani folk music seem akin to the songs of its shifting sands. Maand is the original Rajasthani music that flourished in its courts. Among the professional folk musicians the Bhopas (singing priests), Nats, Bhat puppeteers, Kalbelias and Kanjars made some vital contributions to Rajasthani music . To this day Rajasthani musicians use many unsophisticated indegenous instruments that produce strangely mesmeric sounds - such as the bankia, flutes called algoza, the hypnotic Jewish harp or morchhang, the stringed instrument with a tinkling cluster of bells called the ravanhatta and the earthen pitcher or matka which is turned in the hands with amazing dexterity and is used as a percussion instrument. 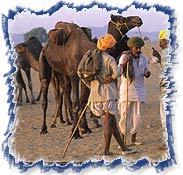 Fairs and festivals are an integral part of the life of the people of Rajasthan, tribals and locals can be seen racing camels, buying and selling elephants, hawking wares and competing and celebrating together. 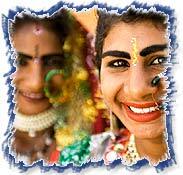 Apart from all the usual Hindu and Muslim festivals Rajasthan has a number of festivals of its own. Choose from the Camel festival at Bikaner in January, Nagaur Fair in January - February; Desert Festival of Jaisalmer in February; Elephant Festival Jaipur; Gangaur Festival celebrated all over the state in March - April; Mewar Festival in Udaipur; Urs in Ajmer Sharif; Teej in the months of August; Marwar Festival at Jodhpur in October; and Camel and Cattle Fair of Pushkar in November. Located in the nort-west of India it is an easily accessible destination. India's oldest mountain chain , the Aravalis runs across this land and is responsible for its hauntingly beautiful landscape as it cuts off the western part of this land from the Monsoon winds, turning it into an arid desert and the east into a more fertile land with dense forests. Rajasthan's dazzling display of handicrafts, and the profusion of vibrantly coloured fabrics, leaves the visitor gasping in wonder. Its lively, crowded markets offer a wide range of local products, and are favourite haunts of visiting shoppers. While times have changed, bazaar protocol has not, and good-humoured, lively bargaining is an important part of the exuberance. If you are interested in a superb deal, search for curio shops selling old silver jewellery. Other popular items on display are tie-and-dye fabrics, embroidered jutis or slippers in suede, camel skin, and velvet, the beautiful and justly famous lacquer bangles, antiques, carpets and Rajasthani puppets. Shikar was a popular sport among the royalty in olden times. Many of Rajasthan's forests are still teeming with ferocious wildlife and have been converted into sanctuaries. These include the Keoladeo Ghana National Park of Bharatpur, one of the finest bird parks in the world. The Ranthambore National Park which is home to the majestic Indian tiger. The Sariska National Park which is a natural habitat for a wide range of wildlife and is best known for the tigers. The Desert National Park of Rajasthan comprises of the vast tracts of desert sands and a unique variety of wildlife species supported by the desert ecosystem. Amongst the smaller sanctuaries and wildlife reserves in Rajasthan are the Bhensrodgarh, Darrah, Jaisamand, Kumbalgarh, Mount Abu, Chambal, Sitamata and Talchappar. 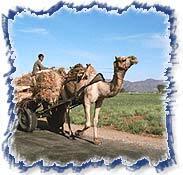 The main occupation of the people in the desert is agriculture and animal husbandry In this handicraft rich province many people are employed in traditional occupations of wood carving, block printing and pottery also. Occupational groups of nomadic hunters, trappers, blacksmiths, basket weavers and entertainers like puppeteers, acrobats, fortune-tellers, singers and dancers share a symbiotic relationship with the settled people.